When you frequently use Terminal, you will use man pages. They contain tons of useful information on most of the tools and commands you use on the shell. 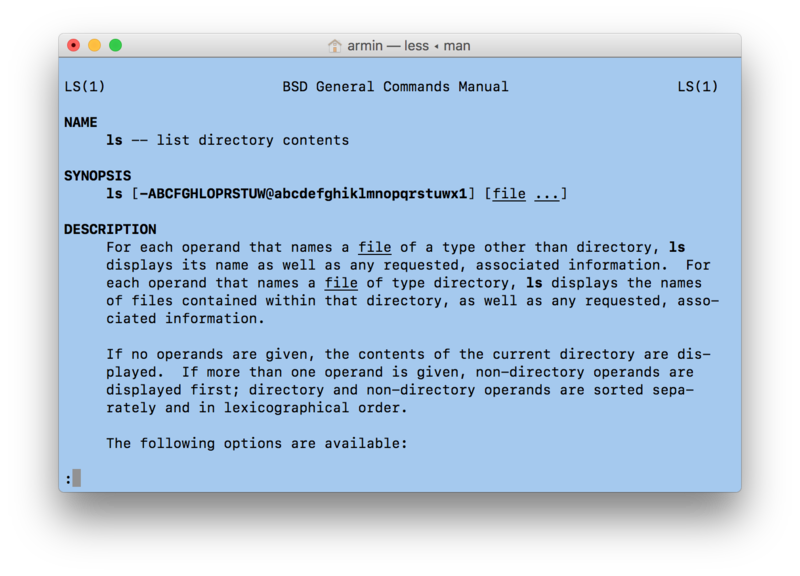 However, the man command’s user interface was designed for terminal output decades ago and does not really integrate well with the modern macOS UI. When you run the man command the output will take over your current Terminal window and scrolling through long man pages can be tedious. However, on macOS you do not have to man like it’s 1989.
instead of man. 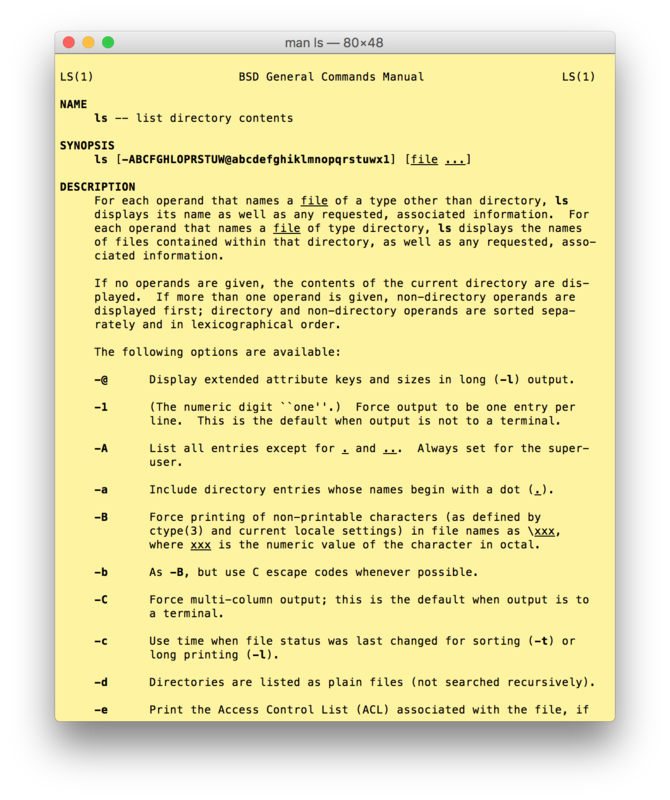 This will open the man page in a new yellow Terminal window, so you can still see what you are actually doing, while reading the man page. If the yellow is just too annoying for you, you can change the look of the window by changing the ‘Man Page’ window profile in the Terminal Preferences. Since this window shows the entire man page, you can scroll and even use ‘Find’ (Command-F) in this window. Note: You could use xman here. 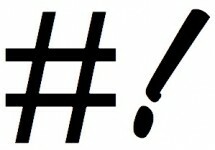 However, that will conflict with another command when you have X11/XQuartz installed. In Terminal, you can open a man page from the context menu. Simply do a secondary (ctrl/right/two-finger) click on a word in a Terminal window and choose ‘Open man Page’ from the context menu. 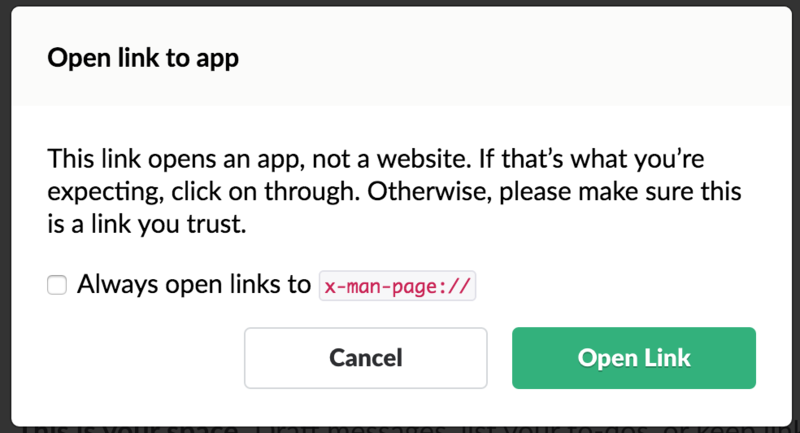 This will open the man page in a separate window, like opening x-man-page URLs. $ man -t ls | open -f -a "Preview"
$ MANWIDTH=80 MANPAGER='col -bx' man $@ | bbedit --clean --view-top -t "man $@"
And again, if want to use this method frequently, create a bash function for it. The ManOpen application has been around for a long, long time, but amazingly, it still works on macOS Sierra. 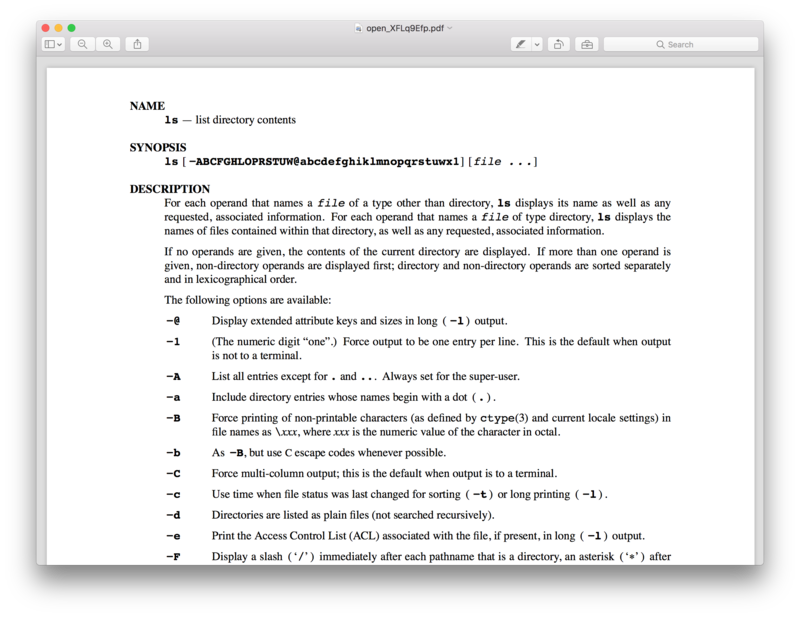 It will also display man pages in a separate window. The main advantage MacOpen has over the other solutions here is that it will automatically detect other commands and highlight them as hyperlinks to their man pages. There is also a command line tool, confusingly called openman to open the app directly from the Terminal. You can also create an Automator Service for this. 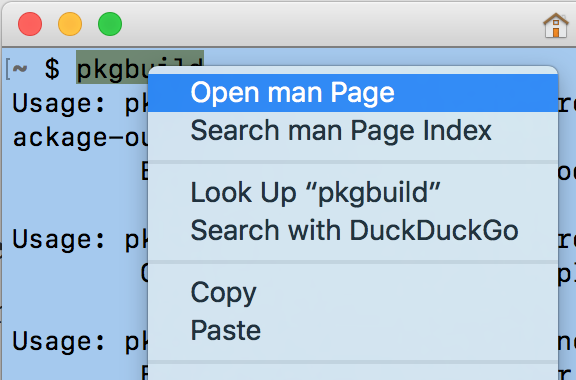 Then you can open man pages from (nearly) any application with a keystroke or from the context menu. I described this in an older post on man pages. You haven’t mentioned `Bwana` – https://bruji.com/bwana/ which allows you to open man pages in Safari.